Trash compactor ram was not working. Watched the video and followed the directions step by step. First I went on YouTube and looked at about 4 different repair videos, but they were for Whirlpool units, not Kenmore. Unplugged unit and removed it from counter space. Removed bottom panel to access the drive gear. Rotated chain counterclockwise to raise the RAM. Then I could remove the trash drawer. Removed the top panel and then removed the RAM from the compactor. Replaced the large drive gear. Lubricated it with grease. Didn't replace the small drive gear because I couldn't remove the drift pin going through the gear and the motor shaft. Re-assembled the panels and plugged it back in and tested it before replacing it in the counter. The compactor abruptly stopped with the ram in the down position. Step 1. Removed the top panel. Step 2. Laid compactor on its side and removed the bottom panel. The large drive gear was broken into 3 pieces. Step 3. Raised the ram manually by turning one of the chain drive gears with a wrench. This took almost a half hour and, while not physically difficult, was tedious. Step 4. Ordered parts. This was not as simple as one might have thought, since I could not locate a model number anywhere on the unit. The picture for the presumptive replacement shows only the large gear. It does not reveal that there is a chain gear attached on the bottom of the drive gear. I was wary of ordering an incorrect part, especially since the part was original to Whirlpool and my compactor was a Maytag. Step 5. 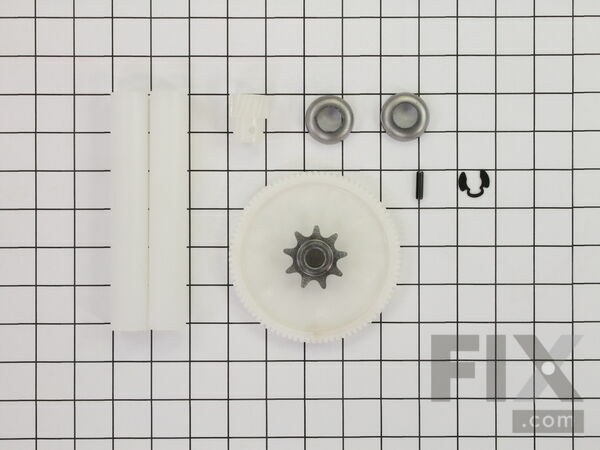 When the parts arrived, I attempted to remove the old chain drive gear but could not because the tension of the chain was too great to permit the gear's removal from the shaft on which it was mounted. I had to detach one of the remaining two chain drive gears to gain enough slack on the chain to remove the old gear. Note: The entire assembly was full of thick grease that got over everything. I would suggest using latex or vinyl gloves during the repair. I would also recommend a heavy duty soap/detergent for cleaning up afterward. Step 6. After removal of the old chain drive gear. the new gear assembly slipped right on. Step 7. I reattached the chain and the loosened gear without difficulty and then replaced the panels. Step 1 unscrewed bottom panel . Step 2 removed broken gear. Step 3 loosened set screws. Step 4 Installed New gear. Step 5 tightened set screws. Step 6 reinstalled bottom panel. Step 7 smiled as I started it up. Compacter not working, door jammed. Very old compactor stripped plastic gears. First was going to replace but found new one is about $700! Gear set came with everything, right down to roll pin and hints on final adjustment. Getting the compactor out of the cabinet and turned over was about the hardest part. Installation went easy with everything fitting perfectly and I saved $700!